Not to be confused with element ytterbium (Yb). Yttrium has no known biological role. Exposure to yttrium compounds can cause lung disease in humans. 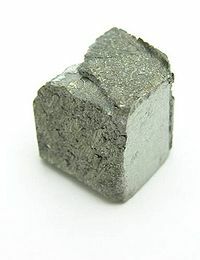 Yttrium is a soft, silver-metallic, lustrous and highly crystalline transition metal in group 3. As expected by periodic trends, it is less electronegative than its predecessor in the group, scandium, and less electronegative than the next member of period 5, zirconium; additionally, it is more electronegative to its successor in its group, lanthanum, surpassing in electronegativity to the later lanthanides due to the lanthanide contraction. Yttrium is the first d-block element in the fifth period. The similarities of yttrium to the lanthanides are so strong that the element has historically been grouped with them as a rare-earth element, and is always found in nature together with them in rare-earth minerals. Chemically, yttrium resembles those elements more closely than its neighbor in the periodic table, scandium, and if physical properties were plotted against atomic number, it would have an apparent number of 64.5 to 67.5, placing it between the lanthanides gadolinium and erbium. One of the few notable differences between the chemistry of yttrium and that of the lanthanides is that yttrium is almost exclusively trivalent, whereas about half the lanthanides can have valences other than three; nevertheless, only for four of the fifteen lanthanides are these other valences important in aqueous solution (CeIV, SmII, EuII, and YbII). All group 3 elements have an odd atomic number, and therefore few stable isotopes. Scandium has one stable isotope, and yttrium itself has only one stable isotope, 89Y, which is also the only isotope that occurs naturally. However, the lanthanide rare earths contain elements of even atomic number and many stable isotopes. Yttrium-89 is thought to be more abundant than it otherwise would be, due in part to the s-process, which allows enough time for isotopes created by other processes to decay by electron emission (neutron → proton). [note 1] Such a slow process tends to favor isotopes with atomic mass numbers (A = protons + neutrons) around 90, 138 and 208, which have unusually stable atomic nuclei with 50, 82, and 126 neutrons, respectively. [note 2] 89Y has a mass number close to 90 and has 50 neutrons in its nucleus. Friedrich Wöhler mistakenly thought he had isolated the metal in 1828 from a volatile chloride he supposed to be yttrium chloride, but Heinrich Rose proved otherwise in 1843 and correctly isolated the element himself that year. Yttrium is found in most rare-earth minerals, it is found in some uranium ores, but is never found in the Earth's crust as a free element. About 31 ppm of the Earth's crust is yttrium, making it the 28th most abundant element, 400 times more common than silver. Yttrium is found in soil in concentrations between 10 and 150 ppm (dry weight average of 23 ppm) and in sea water at 9 ppt. Lunar rock samples collected during the American Apollo Project have a relatively high content of yttrium. Yttrium has no known biological role, though it is found in most, if not all, organisms and tends to concentrate in the liver, kidney, spleen, lungs, and bones of humans. Normally, as little as 0.5 milligrams is found in the entire human body; human breast milk contains 4 ppm. Yttrium can be found in edible plants in concentrations between 20 ppm and 100 ppm (fresh weight), with cabbage having the largest amount. With as much as 700 ppm, the seeds of woody plants have the highest known concentrations. As of April 2018[update] there are reports of the discovery of very large reserves of rare-earth elements on a tiny Japanese island. Minami-Torishima Island, also known as Marcus Island, is described as having "tremendous potential" for rare-earth elements and yttrium (REY), according to a study published in Scientific Reports. "This REY-rich mud has great potential as a rare-earth metal resource because of the enormous amount available and its advantageous mineralogical features," the study reads. The study shows that more than 16 million tons of rare-earth elements could be "exploited in the near future." Including ytrrium (Y), which is used in products like camera lenses and mobile phone screens, the rare-earth elements found are: Europium (EU), Terbium (Tb) and Dysprosium (Dy). Since yttrium is chemically so similar to the lanthanides, it occurs in the same ores (rare-earth minerals) and is extracted by the same refinement processes. A slight distinction is recognized between the light (LREE) and the heavy rare-earth elements (HREE), but the distinction is not perfect. Yttrium is concentrated in the HREE group because of its ion size, though it has a lower atomic mass. A piece of yttrium. Yttrium is difficult to separate from other rare-earth elements. Carbonate and fluoride containing ores such as the LREE bastnäsite ([(Ce, La, etc. )(CO3)F]) contain an average of 0.1% of yttrium compared to the 99.9% for the 16 other REEs. The main source for bastnäsite from the 1960s to the 1990s was the Mountain Pass rare earth mine in California, making the United States the largest producer of REEs during that period. The name "bastnäsite" is actually a group name, and the Levinson suffix is used in the correct mineral names, e.g., bästnasite-(Y) has Y as a prevailing element. Monazite ([(Ce, La, etc. )PO4]), which is mostly phosphate, is a placer deposit of sand created by the transportation and gravitational separation of eroded granite. Monazite as a LREE ore contains 2% (or 3%) yttrium. 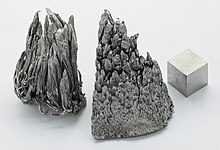 The largest deposits were found in India and Brazil in the early 20th century, making those two countries the largest producers of yttrium in the first half of that century. Of the monazite group, the Ce-dominant member, monazite-(Ce), is the most common one. Xenotime, a REE phosphate, is the main HREE ore containing as much as 60% yttrium as yttrium phosphate (YPO4). This applies to xenotime-(Y). The largest mine is the Bayan Obo deposit in China, making China the largest exporter for HREE since the closure of the Mountain Pass mine in the 1990s. Ion absorption clays or Lognan clays are the weathering products of granite and contain only 1% of REEs. The final ore concentrate can contain as much as 8% yttrium. 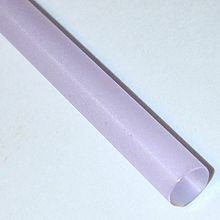 Ion absorption clays are mostly in southern China. Yttrium is also found in samarskite and fergusonite (which also stand for group names). Annual world production of yttrium oxide had reached 600 tonnes by 2001; by 2014 it had increased to 7,000 tons. Global reserves of yttrium oxide were estimated in 2014 to be more than 500,000 tons. The leading countries for these reserves included Australia, Brazil, China, India, and the United States. Only a few tonnes of yttrium metal are produced each year by reducing yttrium fluoride to a metal sponge with calcium magnesium alloy. The temperature of an arc furnace of greater than 1,600 °C is sufficient to melt the yttrium. 2S) host lattice doped with europium (III) cation (Eu3+) phosphors. [note 8] The red color itself is emitted from the europium while the yttrium collects energy from the electron gun and passes it to the phosphor. Yttrium compounds can serve as host lattices for doping with different lanthanide cations. Tb3+ can be used as a doping agent to produce green luminescence. As such yttrium compounds such as yttrium aluminium garnet (YAG) are useful for phosphors and are an important component of white LEDs. 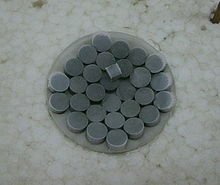 The actual superconducting material is often written as YBa2Cu3O7–d, where d must be less than 0.7 for superconductivity. The reason for this is still not clear, but it is known that the vacancies occur only in certain places in the crystal, the copper oxide planes, and chains, giving rise to a peculiar oxidation state of the copper atoms, which somehow leads to the superconducting behavior. ^ Essentially, a neutron becomes a proton while an electron and antineutrino are emitted. ^ See: magic number. This stability is thought to result from their very low neutron-capture cross-section. (Greenwood 1997, pp. 12–13). Electron emission of isotopes with those mass numbers is simply less prevalent due to this stability, resulting in them having a higher abundance. ^ Metastable isomers have higher-than-normal energy states than the corresponding non-excited nucleus and these states last until a gamma ray or conversion electron is emitted from the isomer. They are designated by an 'm' being placed next to the isotope's mass number. ^ Stwertka 1998, p. 115 says that the identification occurred in 1789 but is silent on when the announcement was made. Van der Krogt 2005 cites the original publication, with the year 1794, by Gadolin. 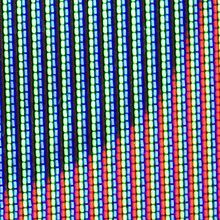 ^ Tc for YBCO is 93 K and the boiling point of nitrogen is 77 K.
^ Emsley 2001, p. 497 says that "Yttrium oxysulfide, doped with europium (III), was used as the standard red component in colour televisions", and Jackson and Christiansen (1993) state that 5–10 g yttrium oxide and 0.5–1 g europium oxide were required to produce a single TV screen, as quoted in Gupta and Krishnamurthy. ^ a b c d e f g h i j k l m n CRC contributors (2007–2008). "Yttrium". In Lide, David R. (ed.). CRC Handbook of Chemistry and Physics. 4. New York: CRC Press. p. 41. ISBN 978-0-8493-0488-0. ^ a b c d e f g h Cotton, Simon A. (2006-03-15). "Scandium, Yttrium & the Lanthanides: Inorganic & Coordination Chemistry". Encyclopedia of Inorganic Chemistry. doi:10.1002/0470862106.ia211. ISBN 978-0-470-86078-6. ^ a b Hammond, C. R. (1985). "Yttrium" (PDF). The Elements. Fermi National Accelerator Laboratory. pp. 4–33. ISBN 978-0-04-910081-7. Archived from the original (PDF) on June 26, 2008. Retrieved 2008-08-26. ^ The electronegativity of both scandium and yttrium are between europium and gadolinium. ^ Daane 1968, p. 810. ^ Daane 1968, p. 815. ^ Cloke, F. Geoffrey N. (1993). "Zero Oxidation State Compounds of Scandium, Yttrium, and the Lanthanides". Chem. Soc. Rev. 22: 17–24. doi:10.1039/CS9932200017. ^ a b c Schumann, Herbert; Fedushkin, Igor L. (2006). Scandium, Yttrium & The Lanthanides: Organometallic Chemistry. Encyclopedia of Inorganic Chemistry. doi:10.1002/0470862106.ia212. ISBN 978-0-470-86078-6. ^ Kang, Weekyung; E. R. Bernstein (2005). "Formation of Yttrium Oxide Clusters Using Pulsed Laser Vaporization". Bull. Korean Chem. Soc. 26 (2): 345–348. doi:10.5012/bkcs.2005.26.2.345. Archived from the original on 2011-07-22. ^ Turner, Jr., Francis M.; Berolzheimer, Daniel D.; Cutter, William P.; Helfrich, John (1920). The Condensed Chemical Dictionary. New York: Chemical Catalog Company. p. 492. Retrieved 2008-08-12. ^ Spencer, James F. (1919). The Metals of the Rare Earths. New York: Longmans, Green, and Co. p. 135. Retrieved 2008-08-12. ^ Pack, Andreas; Sara S. Russell; J. Michael G. Shelley & Mark van Zuilen (2007). 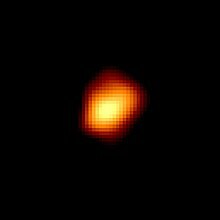 "Geo- and cosmochemistry of the twin elements yttrium and holmium". Geochimica et Cosmochimica Acta. 71 (18): 4592–4608. Bibcode:2007GeCoA..71.4592P. doi:10.1016/j.gca.2007.07.010. ^ a b c d e f g h NNDC contributors (2008). Alejandro A. Sonzogni (Database Manager) (ed.). "Chart of Nuclides". Upton, New York: National Nuclear Data Center, Brookhaven National Laboratory. Retrieved 2008-09-13. ^ Mosander, Carl Gustaf (1843). "Ueber die das Cerium begleitenden neuen Metalle Lathanium und Didymium, so wie über die mit der Yttererde vorkommen-den neuen Metalle Erbium und Terbium". Annalen der Physik und Chemie (in German). 60 (2): 297–315. Bibcode:1843AnP...136..297M. doi:10.1002/andp.18431361008. ^ Britannica contributors (2005). "Ytterbium". Encyclopædia Britannica. Encyclopædia Britannica, Inc.
^ a b Stwertka 1998, p. 115. ^ Heiserman, David L. (1992). "Carl Gustaf Mosander and his Research on rare Earths". Exploring Chemical Elements and their Compounds. New York: TAB Books. p. 41. ISBN 978-0-8306-3018-9. ^ Coplen, Tyler B.; Peiser, H. S. (1998). "History of the Recommended Atomic-Weight Values from 1882 to 1997: A Comparison of Differences from Current Values to the Estimated Uncertainties of Earlier Values (Technical Report)". Pure Appl. Chem. 70 (1): 237–257. doi:10.1351/pac199870010237. ^ a b c d Wu, M. K.; et al. (1987). "Superconductivity at 93 K in a New Mixed-Phase Y-Ba-Cu-O Compound System at Ambient Pressure". Physical Review Letters. 58 (9): 908–910. Bibcode:1987PhRvL..58..908W. doi:10.1103/PhysRevLett.58.908. PMID 10035069. ^ Lenntech contributors. "yttrium". Lenntech. Retrieved 2008-08-26. ^ "Treasure island: Rare metals discovery on remote Pacific atoll is worth billions of dollars". 2018-04-19. ^ a b c d e f g h i j Morteani, Giulio (1991). "The rare earths; their minerals, production and technical use". European Journal of Mineralogy. 3 (4): 641–650. doi:10.1127/ejm/3/4/0641. ^ Kanazawa, Yasuo; Kamitani, Masaharu (2006). "Rare earth minerals and resources in the world". Journal of Alloys and Compounds. 408–412: 1339–1343. doi:10.1016/j.jallcom.2005.04.033. ^ a b c d e Naumov, A. V. (2008). "Review of the World Market of Rare-Earth Metals". Russian Journal of Non-Ferrous Metals. 49 (1): 14–22. doi:10.1007/s11981-008-1004-6 (inactive 2019-03-11). ^ a b "International Mineralogical Association - Commission on New Minerals, Nomenclature and Classification". ^ Zheng, Zuoping; Lin Chuanxian (1996). "The behaviour of rare-earth elements (REE) during weathering of granites in southern Guangxi, China". Chinese Journal of Geochemistry. 15 (4): 344–352. doi:10.1007/BF02867008. ^ a b Holleman, Arnold F.; Wiberg, Egon; Wiberg, Nils (1985). Lehrbuch der Anorganischen Chemie (91–100 ed.). Walter de Gruyter. pp. 1056–1057. ISBN 978-3-11-007511-3. ^ a b "Mineral Commodity Summaries" (PDF). minerals.usgs.gov. Retrieved 2016-12-26. ^ Carley, Larry (December 2000). "Spark Plugs: What's Next After Platinum?". Counterman. Archived from the original on 2008-05-01. Retrieved 2008-09-07. ^ ‹See Tfd›US patent 4533317, ‹See Tfd›Addison, Gilbert J., "Yttrium oxide mantles for fuel-burning lanterns", issued 1985-08-06, assigned to The Coleman Company, Inc.
^ Jaffe, H. W. (1951). "The role of yttrium and other minor elements in the garnet group" (PDF). American Mineralogist: 133–155. Retrieved 2008-08-26. ^ Princep, Andrew J.; Ewings, Russell A.; Boothroyd, Andrew T. (14 November 2017). "The full magnon spectrum of yttrium iron garnet". Quantum Materials. Retrieved 8 April 2019. ^ Vajargah, S. Hosseini; Madaahhosseini, H.; Nemati, Z. (2007). "Preparation and characterization of yttrium iron garnet (YIG) nanocrystalline powders by auto-combustion of nitrate-citrate gel". Journal of Alloys and Compounds. 430 (1–2): 339–343. doi:10.1016/j.jallcom.2006.05.023. ^ GIA contributors (1995). GIA Gem Reference Guide. Gemological Institute of America. ISBN 978-0-87311-019-8. ^ Kiss, Z. J.; Pressley, R. J. (1966). "Crystalline solid lasers". Proceedings of the IEEE. 54 (10): 1236. doi:10.1109/PROC.1966.5112. ^ Kong, J.; Tang, D. Y.; Zhao, B.; Lu, J.; Ueda, K.; Yagi, H. & Yanagitani, T. (2005). "9.2-W diode-pumped Yb:Y2O3 ceramic laser". Applied Physics Letters. 86 (16): 116. Bibcode:2005ApPhL..86p1116K. doi:10.1063/1.1914958. ^ Tokurakawa, M.; Takaichi, K.; Shirakawa, A.; Ueda, K.; Yagi, H.; Yanagitani, T. & Kaminskii, A. A. (2007). "Diode-pumped 188 fs mode-locked Yb3+:Y2O3 ceramic laser". Applied Physics Letters. 90 (7): 071101. Bibcode:2007ApPhL..90g1101T. doi:10.1063/1.2476385. ^ Golubović, Aleksandar V.; Nikolić, Slobodanka N.; Gajić, Radoš; Đurić, Stevan; Valčić, Andreja (2002). "The growth of Nd: YAG single crystals". Journal of the Serbian Chemical Society. 67 (4): 91–300. doi:10.2298/JSC0204291G. ^ "Yttrium". Periodic Table of Elements: LANL. Los Alamos National Security. ^ Berg, Jessica. "Cubic Zirconia". Emporia State University. Retrieved 2008-08-26. ^ Adams, Gregory P.; et al. (2004). "A Single Treatment of Yttrium-90-labeled CHX-A–C6.5 Diabody Inhibits the Growth of Established Human Tumor Xenografts in Immunodeficient Mice". Cancer Research. 64 (17): 6200–6206. doi:10.1158/0008-5472.CAN-03-2382. PMID 15342405. ^ Salem, R; Lewandowski, R. J (2013). "Chemoembolization and Radioembolization for Hepatocellular Carcinoma". Clinical Gastroenterology and Hepatology. 11 (6): 604–611. doi:10.1016/j.cgh.2012.12.039. PMC 3800021. PMID 23357493. ^ Fischer, M.; Modder, G. (2002). "Radionuclide therapy of inflammatory joint diseases". Nuclear Medicine Communications. 23 (9): 829–831. doi:10.1097/00006231-200209000-00003. PMID 12195084. ^ Gianduzzo, Troy; Colombo Jr., Jose R.; Haber, Georges-Pascal; Hafron, Jason; Magi-Galluzzi, Cristina; Aron, Monish; Gill, Inderbir S.; Kaouk, Jihad H. (2008). "Laser robotically assisted nerve-sparing radical prostatectomy: a pilot study of technical feasibility in the canine model". BJU International. 102 (5): 598–602. doi:10.1111/j.1464-410X.2008.07708.x. PMID 18694410. ^ "Yttrium Barium Copper Oxide – YBCO". Imperial College. Retrieved 2009-12-20. ^ "CDC – NIOSH Pocket Guide to Chemical Hazards – Yttrium". www.cdc.gov. Retrieved 2015-11-27. Daane, A. H. (1968). "Yttrium". In Hampel, Clifford A. (ed.). The Encyclopedia of the Chemical Elements. New York: Reinhold Book Corporation. pp. 810–821. LCCN 68029938. OCLC 449569. Emsley, John (2001). "Yttrium". Nature's Building Blocks: An A–Z Guide to the Elements. Oxford, England, UK: Oxford University Press. pp. 495–498. ISBN 978-0-19-850340-8. Stwertka, Albert (1998). "Yttrium". Guide to the Elements (Revised ed.). Oxford University Press. pp. 115–116. ISBN 978-0-19-508083-4. ‹See Tfd›US patent 5734166, ‹See Tfd›Czirr John B., "Low-energy neutron detector based upon lithium lanthanide borate scintillators", issued 1998-03-31, assigned to Mission Support Inc.
"Yttrium" . Encyclopædia Britannica (11th ed.). 1911.